As we reach the end of 2018, it’s time to reflect on and celebrate another rip-roaring year at Pixelwave Creative. We’ve continued to deliver work which connects brands and people in meaningful ways and seen our company evolve into a brand that takes on new challenges and engages with our local community. Let’s firstly take a look back at some of the wonderful new clients we’ve collaborated with on some amazing projects over the past 12 months. Fisherfield Childcare – it was a case of going back to school for the Pixelwave team as we filmed sessions with Fisherfield Childcare, a group of dedicated children’s day nurseries and holiday clubs for parents in the Rochdale and Bury areas. We filmed at seven nurseries to produce eight videos, including a company overview video. Sheffield Teaching Hospitals (STH) – we started working with STH in May 2018 when we were asked to produce a communications film promoting the range of volunteer roles available throughout the trust. 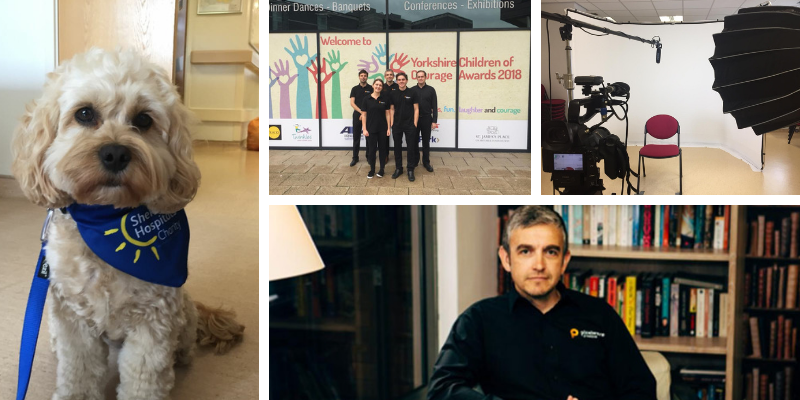 We’ve produced 12 videos this year, including an internal communications film and videos for the trust’s Thank You Awards 2018. We’ll be back in Sheffield in early 2019 to work with STH once again, this time we will be producing a video tour of its new state-of-the-art Eye Centre. Read our STH Case Study..
CILEx Law School – it was fantastic to produce video case studies for National Apprenticeship Week – a fascinating insight into how and why apprenticeships work. Watch our video with law firm Horwich Farrelly which formed part of the CILEx campaign. RD Biomed – medical innovators RD Biomed wanted an instructional video that would show medical professionals how to use their leading reflux diagnostic device Peptest correctly. Our video has now been shared with Peptest users and distribution teams around the world to lots of positive comments. Of course, as well as celebrating our new business, we’re super proud to continue working with our existing brilliant clients, including Health Education England, Barnsley Hospital, Collingwood Learning, Pace, Made In Bury, Yorkshire Choice Awards and Yorkshire Children of Courage Awards. Over the last 12 months, we’ve helped them support and raise awareness of key issues, including safeguarding, child sexual exploitation, Type 1 Diabetes, the dangers of underage drinking and the hellomynameis campaign. Have a look at this fantastic video from the Yorkshire Children of Courage Awards – introducing Bailey Matthews from Doncaster, who won an award for his sporting achievements in the face of cerebral palsy. People like Bailey are an inspiration to capture on film. As well as producing compelling corporate and charity videos, there’s nothing we enjoy more than supporting our local community in Bury and we’ve prioritised the development of young people in 2018. NCS The Challenge – we supported a great group of young people taking part in the NCS – National Citizen Service Challenges – a scheme for 15 to 17 year-olds to take on new challenges, develop new skills and meet new people. Bury College Work Placements – we are proud to help young people in Bury improve and develop their skills for the workplace through work experience and work placements. We also offer work experience and placements, including an internship from De Montfort University. Community Clean up with Freedom Church – we rolled up our sleeves, donned our rubber gloves and joined a sterling team of volunteers to help clean up rubbish as part of Freedom Church’s #LoveGreen event – injecting colour, love & TLC to three local roads – with support from Bury Council. We’ve also taken time for a little bit of sell love too! Business development has been key to our growing success in 2018, and this began with our move into Bury’s Freedom Church. Giving us the opportunity to invest in new technology that supports larger-scale filming productions; is more energy efficient and helps us to deliver impressive visuals quicker and easier. Then, we graduated from the Greater Manchester Growth Hub’s Spark2Scale programme – a cohort-led support programme specifically designed to help aspiring businesses make the steps they need to fulfil their potential. So, what’s next for the Pixelwave team? 2019 is just days away but we’ve already got some awesome new projects up our sleeves, exciting news about a new recruit and an office move on the cards… we look forward to sharing these adventures with you soon. Until next year, all that’s left is to say a massive thank you to our wonderful clients, partners and friends. And to wish you all a very successful 2019.